The time; 7 p.m (ish). The venue; St Andrews. The date; Thursday 27 September 2018. Who and what? ; Paul John Whisky with Shilton Almeida. I was away to St Andrews, roughly 35 minutes from home in Perth, to a tasting night. I have known Paul John Distilleries for quite some time, Michael is the master, Shilton the presenter!!! Not only was this a great night, previously, Michael had sent me whiskies for us to use in our whisky tours and tastings. Later next month (October) we head up to Dornoch for their whisky fest, taking three excellent PJ drams with us. So the evening was a great taster of things to come – see what I did there? The hosts – St Andrews Whisky Society affectionately known as the Quaich Society, (or Quaich Soc) – was founded in 1994 and has been introducing drams since. I was invited by Aedan A. Burt, Quaich Soc. President . Loosely attached to the University of St Andrews. ALL proceeds from the event went to aid the work of the charity Water Aid. WaterAid has teams in 34 countries across the world, working with partners to transform millions of lives every year by improving access to clean water, toilets and hygiene. ‘St Andrews Quaich Society was founded originally by students and attached to the Students Association. The Society quickly sought the support of Luvians, then only in Cupar, with which we have been affiliated since 1996. The Society holds regular whisky tastings, hosted by leading Brand Ambassadors, that are open to all. The Society also soon disaffiliated from the Union due to venue and alcohol policy problems, to truly become a Town and Gown Society – anyone may attend, become a member, or join the Committee at our annual elections – attendance is currently £7 for members and £12 for non-members, with tickets on the door. Membership is only £15, which includes a free Glencairn glass and a 7.5% discount on whisky purchases at Luvians (St Andrews, Cupar, and soon online). Membership can be bought at every event. Through Luvians, we are also affiliated with the charity WaterAid, providing clean water and sanitation in areas without. I had been invited along by Aedan A. Burt, Quaich Soc. President, to see how they arrange the evenings, I knew it was Shilton and of course I said aye. I arrived late afternoon, parked up and dondered around St Andrews – as you do. Bumped into Jackie from Weymss/Kingsbarns and had a wee chat, she was taking a gin evening also in town. Had an early dinner in the Tailend, a monster fisg appeared on a plate hardly large enough for it, I did manage to make it disappear. After some window shopping and whisky shop curiosities, I arrived early at the hotel, nice by the way. Sat in the bar, enjoyed two pots of tea and read a book (driving tonight). Whilst gazing about bored, I happened to spot some likely suspects arriving for the set up, I was correct, so went in and said hello, sat down and watched the chaos start. A few Uni guys were pouring 55 drams x 5 bottles out, lined up on a large table, not how we would have done it but ok. Shilton arrived, let him make contact with them before a quick wave hello. Smiling he came over, sat down and we chatted for some time about this, that, people we both knew, Charlie Mac especially and Michael, his boss. Attendees piled in, paying on the door – it was mostly university people – and all found a seat. After more conversation with Shilton, I sat doon and took stock. Off he went into a great wee staory about himself, I didnee know he was named after goalie Peter Shilton! Learn something new every day. He drifted into distillery talk, weather in Goa and all things Indian, by the way, Indian Angels get almost 12% share (Bangalore), on to the first dram; Brilliance @ 46%. I won’t go into every dram but this one is 5 – 6 years old. The oldest cask they have is 8 year old, over two warehouse collections, one above ground and one below – unusual to say the least. 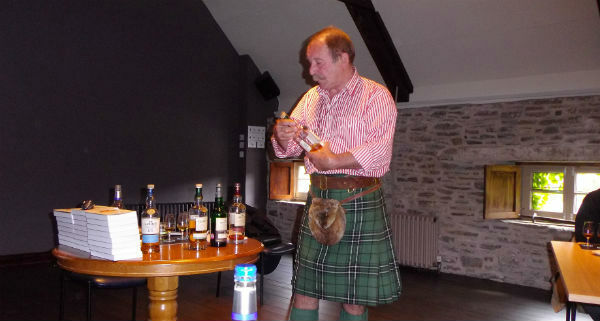 More drams followed with great patter from Shilton – he was good. Drams included; Classic @ 55.2%, Edited @ 46%, Bold (peated) 46% and Peated @ 55.5%.. It was around a two hour tasting evening, with drams, chat, questions etc, aye he had also prepared a presentation which was excellent on screen. Paul John Distillery uses two kinds of peat, both Scottish exports, highlands and Islay – think of it as Scottish peat taking a 6 year holiday in Goa then coming back to their birthplace, that’s what was on offer this evening. One or two drams I was hoping for never arrived, sad face here. The Christmas Edition limited run and the fabulous Olorosso finish, och next time. It was really interesting listening about the distillery, how it started and some other drams on offer – ie; Original Choice, especially as we can buy it in Goa at 50p or £1 per carton!!! The evening drew to a close, I had my photos, my good memories of my chats with Shilton and drove to my hotel 6 miles away – I hadnee had an alcoholic drink all day! But did take some samples away. So, I said to Aedan, can anyone join your group? 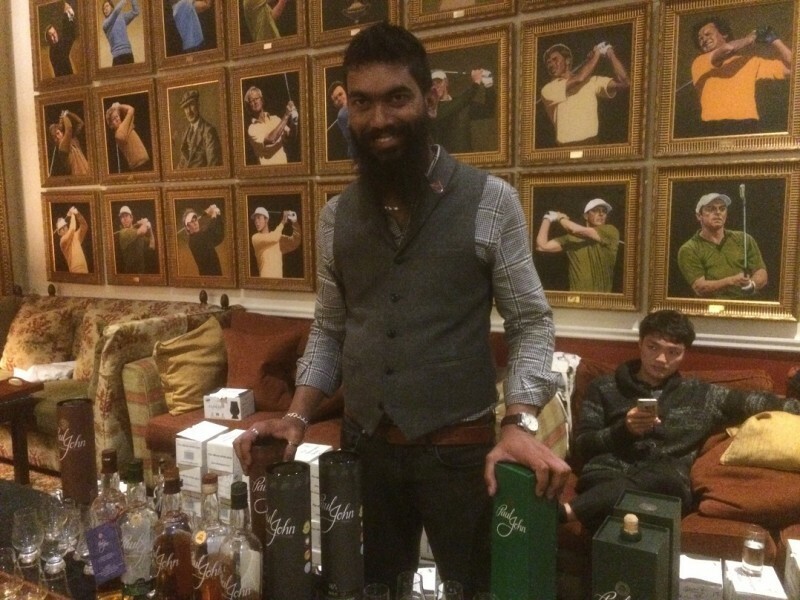 Aye – St Andrews Whisky Society. Find them on facebook. All told this was an enjoyable event, made better by the people there and the drams tabled. I do have to thank both Michael and Shilton (PJ) for the whisky they supplied for our upcoming tours, a bunch of whisky hungry Swedes for a week, and a whisky fest in Dornoch with Swiss and Indian guests. Shilton and myself agreed to meet up again as soon as we can both make diary space, we would love him to be this relaxed and good, presenting PJ drams to one (or more) of our groups in future. Saving that for another day – see what I did there? Saving, goalie! Oh well.